DejaUI is an up to date compilation of all of my addons put into one neat and tidy package. Check out all of my adddons at VIIGaming.com. DejaUI is designed for me, Dejablue of Alterac Mountains, but anyone else can use it. It's native resolution is 1920x1080. There are no options so if you want to change things you will have to edit the lua files. Stacks the action bars, stance/shapeshift and pet action bars. Stacks the micro menu buttons and the left and right bars next to the main bar for easy access. Makes all elements except the main bar show/hide on mouse-over. Moves the buffs to the top right corner. Moves the debuffs to the center and slightly to the left. Shows and hides the target and world markers while holding a hotkey. Right click an icon to place a world marker. Hides the red error text spam at the top of the screen. Moves the default tooltip to just above the bottom right corner gryphon. Hides the XP and Reputation art. DejaMinimap and DejaStats are now drag-able with Shift+Right Drag. Added coordinates to the minimap. Added visible clock to the minimap. Made the minimap drag-able and able to save the user's placement. Fixed the Guild Instance Difficulty parenting issue with the minimap. Moved the unit frame icons (leader, raid target, etc.) to make the frames appear more cohesive. Moved the target buff and debuff frames so that they do not overlap. Fixed the hidden bars after a cinematic issue. Made all action bar elements except the main bar show/hide on mouse-over. Added automatic sale of junk gray items. Added automatic repairs for player armor at a repair vendor. Guild bank repairs are attempted first. Death Knight runes now properly show and hide in and out of combat. Updated with DejaXPBar 1.1.0 integration. Buffs, debuffs and playerframe all show and hide on enter and exit of combat. All but the main action bar are now hidden and show on mousover. DejaViewport removed from .toc, still included for those that wish to manually enable it. 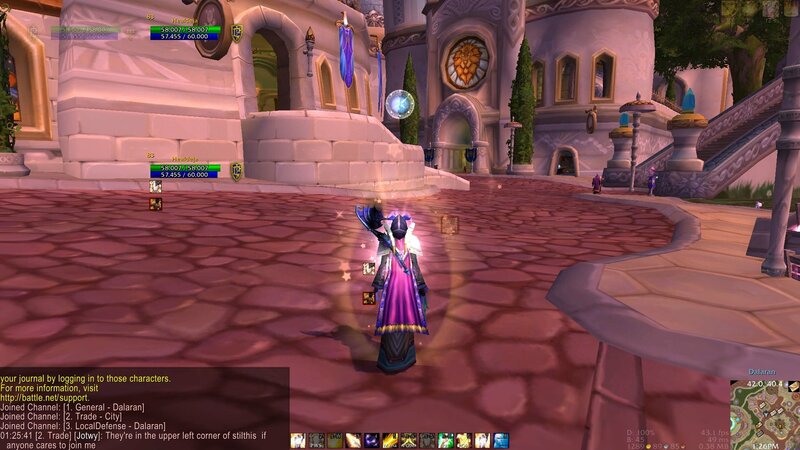 Fades the party and raid manager frame (that bar on the left when you are in a party or raid. Fades in the party and raid frame manager on mouseover. Rewrote some things so that, hopefully, other addons do not move the action bars. Fixed the strata of the hidden main menu bar so it does not interfere with other frames. Made XP and Rep bars over the player frame visible again. Fixed taint with Phanx's help. Fixed the "Interface action failed because of an addon" taint error. Fixed the debuff, target debuff and minimap lua errors. Moved the target debuff display to the center of the screen about 1/3 above the bottom. Moved the player debuff display just left of center of the screen. Moved the minimap mail indicator to the upper right corner of the minimap. Moved the instance difficulty indicator to the top left corner of the minimap. Moved the record button to the bottom left corner of the minimap. Hid the calendar icon and moved it to the top right of the minimap, click on the top right of the minimap to open the calendar. Hid the world map icon and moved it to the upper middle of the minimap, click on the upper middle of the minimap to open the world map. Fixed the green minimap when in raids. Added experience and reputation bars above the player unit frame. Moved the buff frame all the way to the upper right hand corner. Moved the zone text just above the minimap. Removed the art from the player, pet, target and focus frames for a sleek look. Moved the focus cast bar just above the focus unit frame. Hid the clock button, display time on mouseover of the bottom of the minimap, click for the timer. Hid the tracking button, click on the minimap's upper left corner for tracking menu. Hid the minimap north marker. Included a modified version of BobUI's cast bars for player, target and focus. Added slash commands /rl, /rc and cr for reload UI, ready check and role check respectively. Moved the default tooltip just above the minimap in the right hand bottom corner. Organized the Lua file to be navigated more easily by others. Hid the red error text spam at the top of the screen. Resized the minimap again to align with the top of the stance and pet action bars. Hid the stance frame background texture. Updated the minimap so it aligns with the top of the stance and pet action bars. You can move DejaMinimap and DejaStats now with Shift+Right drag instead of right drag. This makes it so you don't accidentally move the frames. Why not make an option to turn the drag on and off with a slash command? I know, man but I didn't want others to think I thought it was stupid hehe, Hey, thanks again for all of your generous help along the way. Last edited by 10leej : 08-30-12 at 02:40 AM.